This chapter makes a contribution to the ongoing efforts to fill the emerging market perspective gap in the entrepreneurship literature with respect to Turkey. 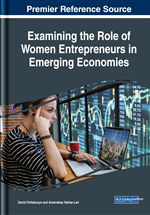 It primarily provides a thorough account of the current position of women entrepreneurs operating in the Turkish economy. With exhibitions of current demographic data and statistics, it offers a comprehensive depiction of the importance of women entrepreneurs to the viability of the Turkish economy. Moreover, this chapter sheds light on the deficient aspects of the Turkish system in terms of societal, economic, and professional challenges are and will try to explore how these factors affect the performance of women entrepreneurs while recommending possible routes for improvement. Driving the dynamic business environment fueled by innovation, entrepreneurs can be defined as individuals who bring about an improvement, both for other individuals and for society as a whole (Hisrich & Peters, 2002). However, Bruton et al. (2008:4) emphasize that the majority of research on entrepreneurs has originated from developed country perspectives and little is known of entrepreneurship in emerging economies. They contend that “analyzing entrepreneurship only from developed economy point of view presumes invariant entrepreneurial behaviors and outcomes irrespective of the country where they are located” (Bruton., 11). Therefore, for the practitioners and academics to get a complete sense of the current standing of women entrepreneurs, the emerging market point of view needs further amplification with diverse perspectives. In particular, Turkey provides a unique setting that is tenacious in the quest for global integration. Hence, the motivation behind this chapter is to make a significant contribution to literature by providing a thorough account of the current position of women entrepreneurs in Turkey. With exhibitions of current demographic data and statistics, this chapter will also highlight the deficient aspects of the Turkish economy while recommending possible routes for improvement. As emerging markets are dynamic, volatile and relatively unpredictable; the problems that entrepreneurs cope with would be much more challenging compared to those in developed market settings. They may run into more difficulties throughout their entrepreneurial journeys due to lesser amounts of support from market mechanisms. Despite the emerging market conditions affecting the mix of attitudes, resources, and infrastructure, – the entrepreneurship ecosystem (GEM – Global Entrepreneurship Monitor, 2017) – Turkey is growing in numbers of startups operating in several industries widely ranging from health, food and beverage sector, social media, smart mobility, e-commerce to fin-tech. As for women, a growing number of women entrepreneurs such as Başak Taşpınar Değim for Armut.com, Demet Mutlu for Trendyol, Gamze Cizreli for BigChefs, Hande Çaydaşı for Bebeshop and Deniz Eraner for Bonvagon.com have attracted significant attention from both practitioners and academics.